I've used Gimp in both Linux and OS X for many years. However, I'm not even remotely an expert in photo re-touching. But I do a lot of simple things such as resizing photos to include them in this blog or in emails, for example. Amazingly, I was used to resizing each individually which can be time-consuming if you have more than just a handful of shots. This link explains how to use BIMP. To install it, just go to this GitHub link where you can download the source for compilation in Linux (very quick compile and install) or the binary for Windows (which I haven't yet used). Interestingly, for Mac 10.8, Gimp 2.8.6 already has Bimp integrated into its structure. 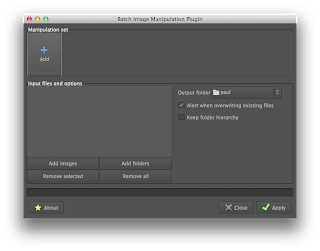 To use it, simply click on File and then Batch Image Manipulation Plugin. Thereupon, the window to the right will open. This really is a very necessary addition to Gimp and it dramatically improves its usefulness for simple users like me.